Featured Junior Skater: Kell Yeah! I get the same response every single time. “How did she get into that?” The trigger for that question? 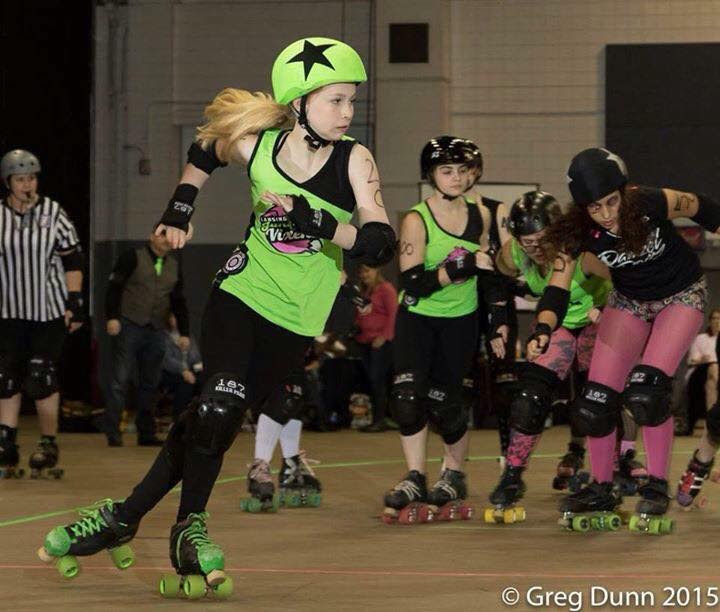 “My daughter does roller derby; she skates for the Lansing Junior Vixens”. This then is followed by a conversation about roller derby; how it’s played, where it’s played, the safety of it, and explaining that it is gaining popularity by the month. I’m not going to lie – I love that my kid chose such a cool, unique sport that not a lot of others do. I love that my kid chose to leave the norm and do something that can often be seen as “out-of-character,” “unlady-like,” and “rough” – yes, I have heard all these words used at least once. But people are dead wrong. Derby is character – our girls are each their own, and proud of it. They are comfortable in their own skin, they choose what to wear and how to look because they like it, and they are some of the strongest girls I know because of it. And the best part? These girls, ages 8-17, are each others biggest cheerleaders. They are sisters. They are each others guides. They come from all over the Lansing area, and that along with age doesn’t matter a bit – they still support one another wholeheartedly. I love it. Unlady-like? Thank God. I’m raising my girl to be a person. I’m raising my girl to be strong, independent, and to speak up for herself. I’m raising a human being that I want to feel accepted inside and out, and derby helps with that. She sees members of the adult team and looks up to them, which makes this momma so happy. Why? Derby girls, especially Lansing Vixen derby girls, are strong, fierce, independent power houses that I am absolutely envious of. If I could choose an ideal role model for my girl, it would be any of the LDV/LJV derby girls. Rough? Sure, but so is any contact sport out there. Yet, in what other sport do you know where the refs do full equipment check not once, but twice during a bout? What other sport do you know of where penalties are given for not wearing a mouthguard or improper use of a mouthguard (chewing on it)? What other sport/team has EMS on site for a bout? And this is unique to LDV, and it is why this organization is so classy and respected. Safety comes first, and as a protective momma, I am very appreciative to the organization for it. I am so happy, so honored and so grateful to be able to say that my girl is a skater for the Lansing Junior Vixens, and I’ll let you in on a secret; like most parents, I hope she goes off to a good college, but I also really hope it’s one close enough that she can continue to play for LDV when she ages out as a junior. Regardless, whatever path she chooses, I can rest assured that she will be one incredible person, because she had derby in her life. And not just any derby, but Lansing Vixen derby. ◂ Message from the LDV Prez Gina Rome Regarding the Upcoming 2016 Season!